She may look like she’s alive, but she’s really a robot for training dental students. You can see what she looks like with her skin off here. Japan is famous for its hi-tech companies that make everything from computer chips to cars, and much of its phenomenal success is due to the widespread use of robots. Every two years organizations from all over the world come together in Tokyo for the International Robot Exhibition (also known as IREX), the world’s biggest robot trade fair. Whether you’re a serious enthusiast, or you just want to gape in wonder at a plethora of futuristic gizmos, there are more robots on show here than anywhere else in the world. This roller-skating robot was one of the cutest robots on display at IREX 2007. Robots have a prominent position in the Japanese national consciousness. The latest developments are often shown on television, or demonstrated to foreign dignitaries when they visit Japan. 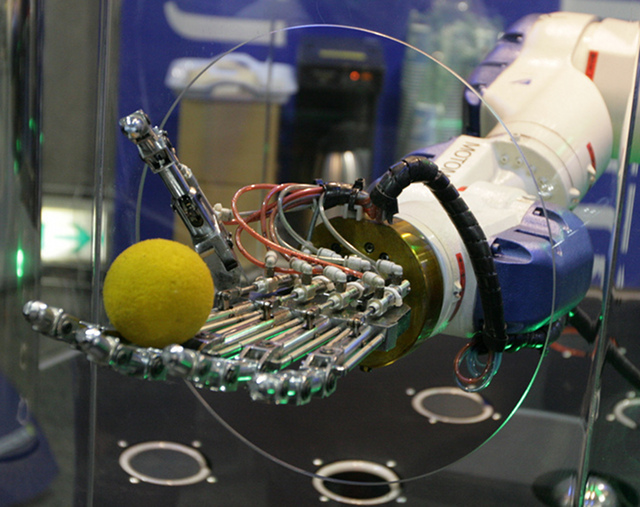 The International Robot Exhibition has been run since 1973, and has grown to the point where each event is attended by over 100,000 visitors, who come to see displays put on by over 250 organizations. 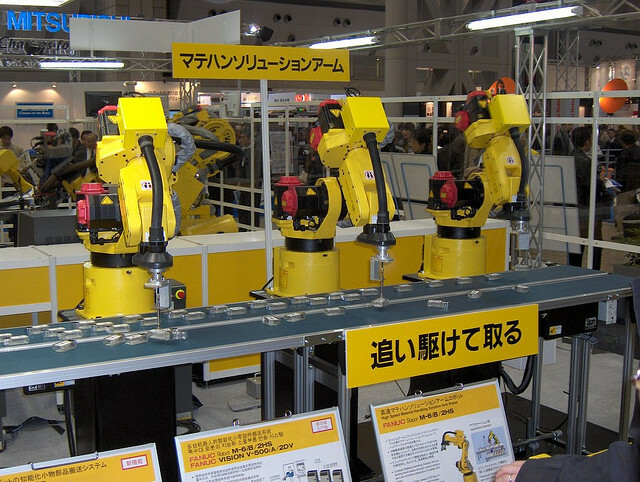 Most of the exhibitors are Japanese companies, who together manufacture $6,000,000,000 worth of robots each year, two-thirds of which are exported. In addition, around 50 exhibitors come from overseas, and some of Japan’s leading universities and research labs also put on displays. The variety of robots on show is impressive – there is everything from super-fast robot arms for assembling electronics to giant six-legged spider robots for who knows what purpose. The robots demonstrate their proficiency by undertaking a multiplicity of tasks, including threading needles, cartwheeling, lifting heavy weights, playing drums, climbing ladders, and even acting out kabuki plays. Many of these robots normally earn their keep in the factories of Japan, but some are specially made just to showcase their makers’ expertise. IREX 2009. If you look closely, you can see the TOSY ping-pong playing robot from Vietnam. The fair is mainly aimed at industry professionals – the robot companies are out to promote themselves and sell their robots. Despite this, it’s popular with Japan’s many robot devotees, and the professionals in their suits and white coats mingle with people of all ages, from retirees to young children. You’ll soon find that most of the people who work in the industry have a passion for robotics – and are keen to talk to visitors and demonstrate their products regardless of whether or not you’re a potential customer. There are even some booths targeted at the hobbyist rather than the professional, so you’ll be able to buy your own robot kit to assemble once you’ve got home. 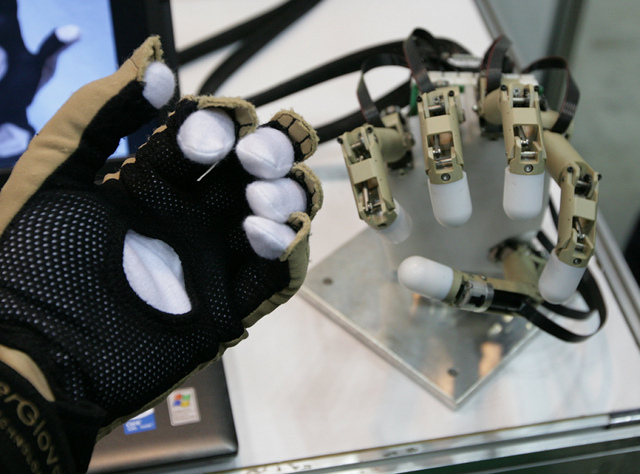 This very human-like hand belongs to a Yaskawa Motoman robot which is showing off its ability to manipulate objects. By now robots are firmly established as a core tool in manufacturing, and much of the research now focuses on finding new uses for robots. Walking around the fair, you’ll come across a profusion of robots, each with a specific application in mind. Past shows have included fire-fighting robots, robot pets, robot surgeons, robot bartenders, construction robots, rice-paddy-weeding robots, robots that can do carpentry, teaching robots, cleaning robots, cycling robots and robot submarines. One year there was even a robot made out of cardboard, and a swarm of robots that communicated with chemical signals, just like ants do when they form foraging trails. With all these machines under development, it seems likely that more of us are going to be living and working alongside robots in the not too distant future – but it’s anyone’s guess which of these ideas will be successful and which will soon be consigned to the dustbin of history. Most of the industrial robotics companies strictly prohibit photography – they don’t want their competitors stealing their ideas – but thankfully there are some exceptions. These optically-guided ‘Matehan Solution Arms’ are picking up objects from a conveyor belt and arranging them in neat rows. A journalist who couldn’t make it to Tokyo once used a ‘telepresence’ robot that was equipped with cameras and microphones to interview attendees. This allowed him to move around the exhibition and talk to people, using loud speakers and a computer screen built into the robot, even though he was really sitting at a desk in his office in America. 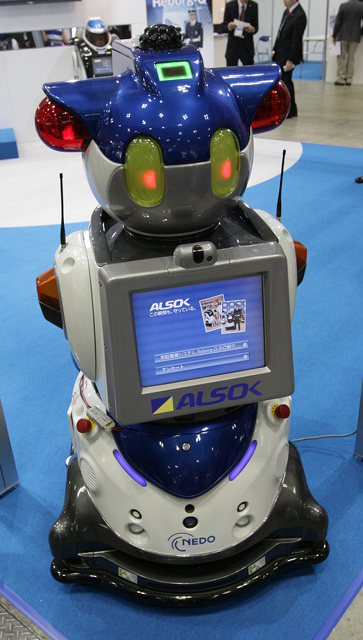 Thieves beware – this robot security guard from ALSOK is after you! He reported that it really did feel almost like being there in person. 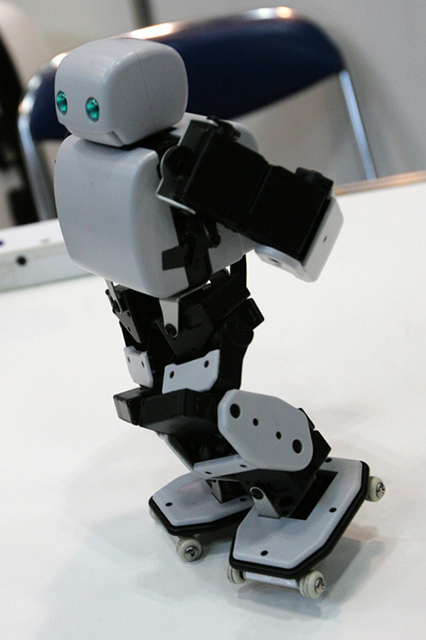 More advanced telepresence robots have arms that allow their controllers to remotely pick up and move objects. One of the main applications proposed for this type of robot is to help care for the elderly and disabled. This is a big issue in Japan, as the population is aging very rapidly while the birth-rate is dropping, but so far Japan’s older people don’t seem overly impressed by the robotic approach to care. Some of the inventions seem to rely more on wishful-thinking than on common sense, such as the robot guide dog for the blind that was demonstrated at the 2011 exhibition. It had four legs and could recognize obstacles and walk up and down stairs, but as it couldn’t navigate busy streets and wait for gaps in the traffic before crossing the road, it wouldn’t be much use in practice. Its makers seem to have completely missed the point about guide dogs – what matters is not having four legs, it’s safely getting their owners to wherever they want to be. Besides the many booths, you also have the chance to attend symposiums and debates on the future of robotics, some of which are in English or have simultaneous interpretation. If that sounds a bit dull, on the Saturday there’s usually a robot sumo contest – two-legged humanoid robots try to knock their opponents over or push them out of the ring. I’m not sure if this contest will do anything to advance the state of the art in robotics, but it’s a lot of fun to watch. The exhibition’s official aim may be to ‘enhance market awareness of new technology’, but I think it makes a great tourist attraction. This robot hand mimics every movement of the hand in the glove, allowing you to easily manipulate objects from a distance. IREX is held over four days (Wednesday to Saturday) in early November every odd-numbered year. It’s organized by the Japan Robot Association, so check their website for details of the next event. Entry is ¥1,000, and it’s usually open from 10am to 5pm (4:30pm on the Saturday). 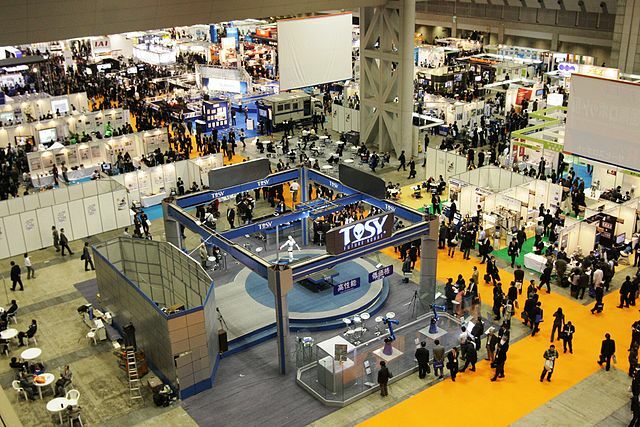 The venue is the giant east hall of Tokyo Big Site exhibition centre. (See here for details of how to get there.) After a visit, you’ll wonder why you ever went to the science museum to see yesterday’s technology, when you could have gone to IREX to see tomorrow’s. 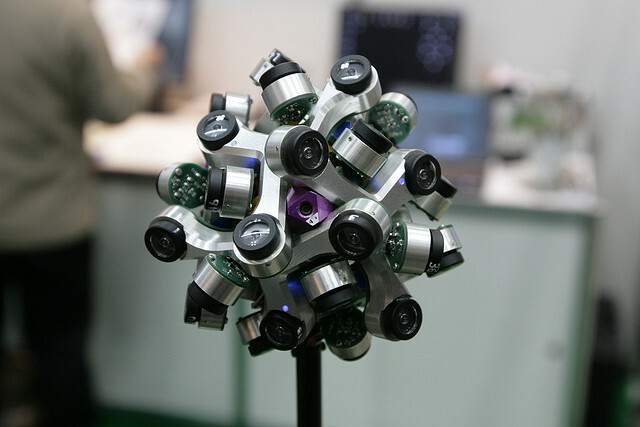 There’s nowhere to hide from the Omni Cam – it can see in all directions at once.